Hammer Pick of Skull Bashing + 3. Card Artwork. 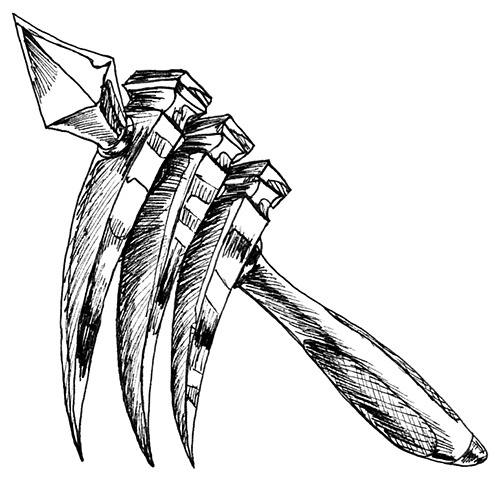 Item Type: From the makers of multi-bladed razors, comes the ultimate in multi- pointed skull crushing. This is from a series of card artwork I'm working on with a friend in getting his card party game off the ground. The game, Thy Dunjon Quest, is a party game utilizing elements of charades and blackjack for players to go one mock quests and encounters while gambling their gear based on success or failure. From the makers of the +3 Shaving Razor, comes the +3 Hammer Pick of Skull Bashing. Like three times the closeness in shaving; The Hammer Pick delivers three times the crushed skulls of your enemies in one fell swoop. This weapon was explained to me as a play on the Mach 3 Razorblade from Gillette, so I had too draw a weapon version on the same premise. The warhammer design worked best and handle designed like a store razor sealed the look. Plus, its a cool weapon that made my friend wonder why such a thing wasn't created in medieval times.